Welcome to Part 2 of my adventure in Italy. If you missed part 1 you can find it here. We trained to Venice from Milan. The landscape seemed to change every 30 minutes starting with the Italian alps then the rocky Dolomites after that the green wetlands and finally the waters of Laguna Veneta were in sight. Arriving on the steps of the Venezia Santa Lucia reminded me of my first time in NYC or Disney World. Sensory overload. The sounds, sights, feelings, and smells overwhelmed me. I pulled off my jacket as the sun beamed unseasonable warmth and I took in my first glimpse of life on the canal; boats with loud motors chaotically swerving around one another, people rushing by chattering in every language, beautiful ancient buildings like nothing I'd ever seen, the constant flutter of birds scurrying towards anything that might be edible, street hustlers pointing selfie sticks in my face, and the more adapted tourists enjoying a cannoli at a nearby cafe. We immediately tried to figure out which vaporetto (or water bus) to take. I had done a little research and knew we wanted to take a slow boat so we could behold the Grand Canal in all it's glory. It was an hour long ride so this was the only time we got to see the Canal from start to finish and there is so much to see. I elbowed my way to the open air back of the boat where I would have an unhindered 90 degree view. This line made many stops and more people came with each one. Since there are limited forms of transportation in Venice it's safe to say that it got pretty crowded but I refused to budge or become smaller. This was where I wanted to catch as much as I could of the beautiful madness no matter how many people tried to scoot pass my seat and block my view. Any seasoned photographer knows the right moment when to politely fight for the shot and I'm glad I stayed put because I captured my favorite image - the one above. The smattering of sleek gondolas settled into our choppy wake for a sunset view of the breathtaking Santa Maria della Salute while I sailed on to try out my sea legs in the floating city. 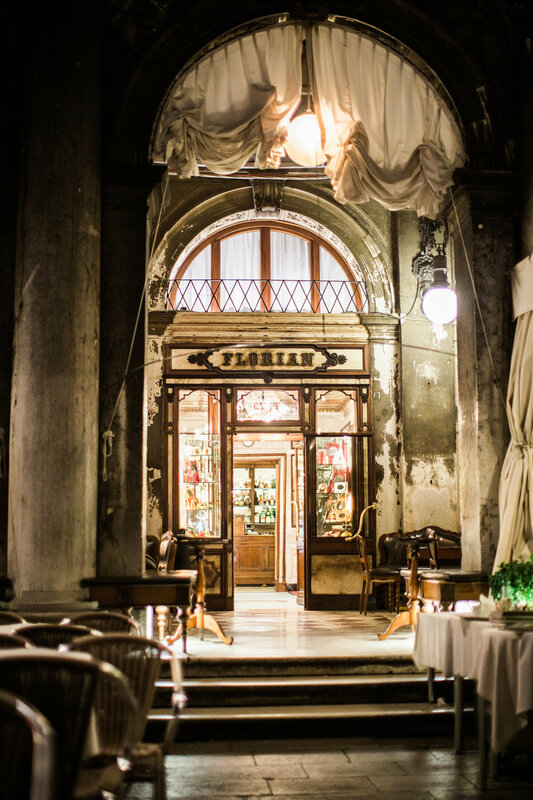 We capped off the evening with espresso and dessert at the oldest cafe in the world, The Florian. Dueling orchestras played across San Marco as we enjoyed our treats. The next day we would find this same piazza crammed with tourist but for the moment it was pleasantly calm. I took home a rose to remember it by. 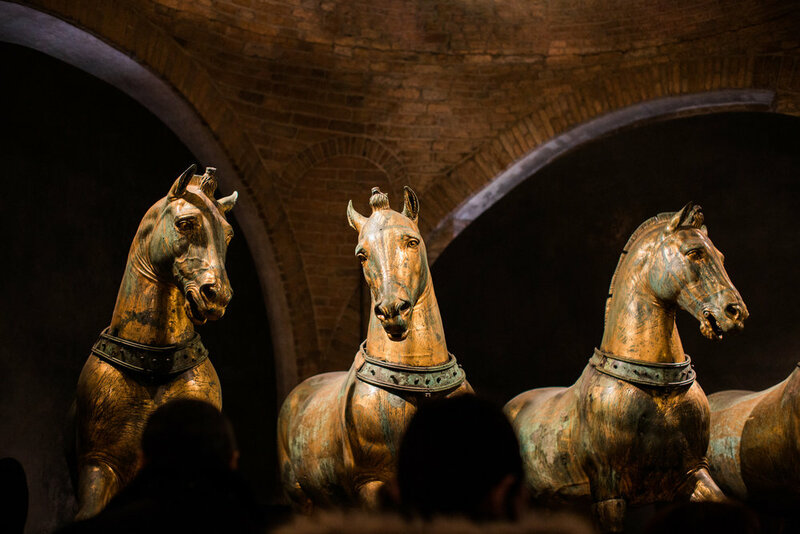 The next day we toured the Doge's Palace and learned all about Casanova, the Bridge of Sighs, and the History of the Doges. Onto St. Mark's Basilica where the walls were tiled with gold leaf. It was the most beautiful Duomo I have ever seen and also the oldest. The view from the top the cathedral could of entertained me for days. Bong, bong, bong went the clock tower as the tiny ant-like people swarmed below all the while the winged lion looked on. My thoughts were whisked away to a time when this beautiful city was at it's peak as a great maritime power. Later we grabbed an espresso and some beautiful monochromatic watercolor street art then we jump onto a gondola for a cruise around the canals. It's a must do in Venice. A striped shirt driver steered us around each obstacle with ease while crooning inaudibly. I had heard about a quirky bookstore Libreria Acqua Alta. It is packed with new and used books. There are so many books that they are used as decor and even as stairs. The owner is very proud of his shop as well as the store mascot; a black cat that sits on piles of books. It was a tight squeeze so I couldn't do much shopping but left intrigued all the same. 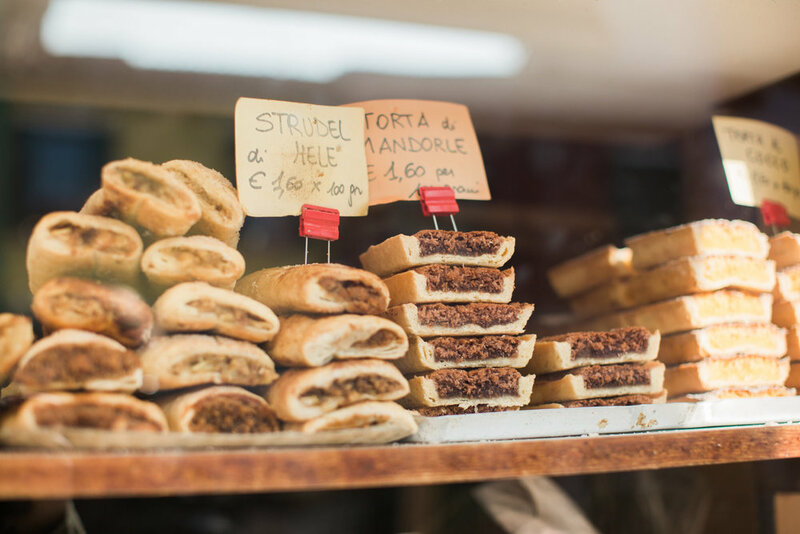 We crossed the Rialto bridge to explore a little of Dorsoduro. The sun had faded and I sat at the edge of that island while boats came back and forth. 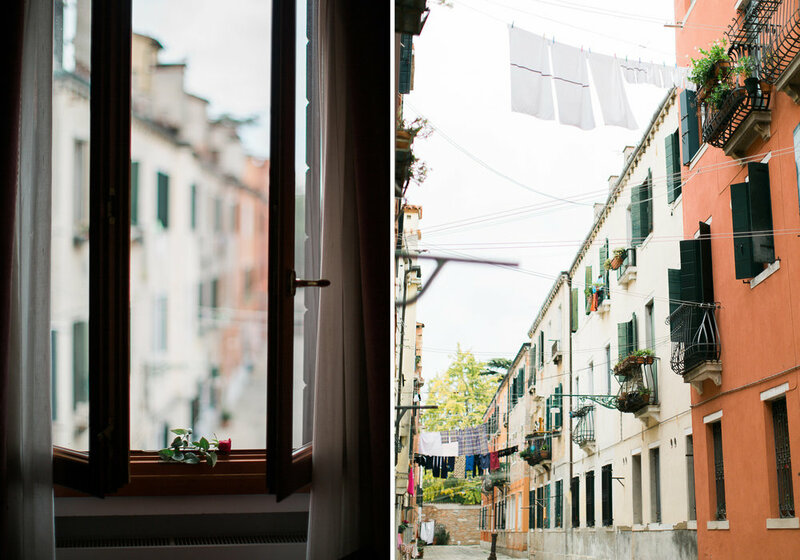 It was our favorite day in Venice. 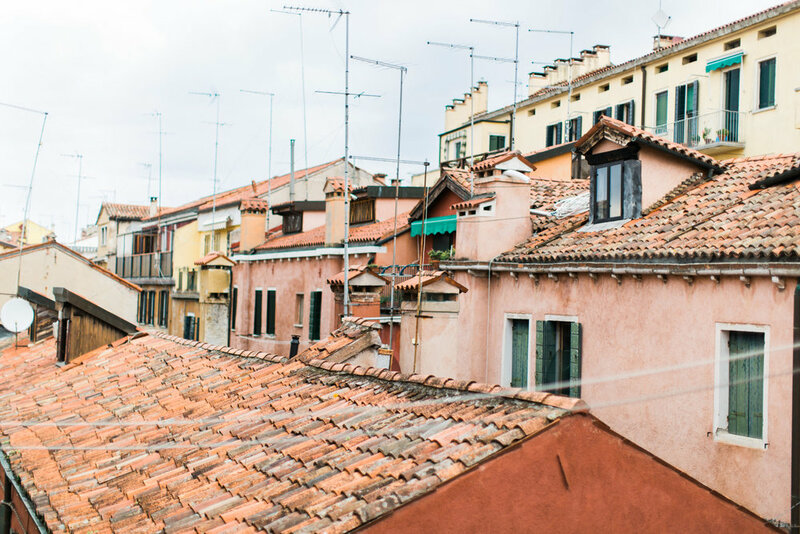 Our last full day in Venice was spent with a day trip to the Island of Burano. It took several hours to get there between slow vaporettos then a ferry to Murano plus a layover until our next ferry to our final destination. We reached the colorful island hungry but ready to explore. 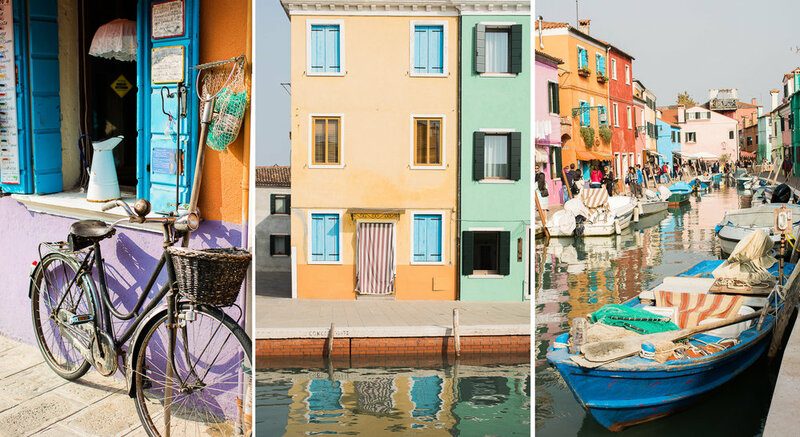 Burano was known for exporting lace but the thing that stands out most is the brightly painted houses. The story goes that the wives saturated their homes with color so their seafaring husbands could spot their own house from a distance. We quickly found out the island was indeed small so after capturing as much as I could of it's beauty we settled down for a weird lunch. Unsure of where to eat we took a chance on Trattoria da Primo e Paolo. A lovely little restaurant that specializes in the local cuisine; seafood. We were a little scared but dove into the seafood platter although some things had eyes and tentacles. Our risotta primi and fried secondi was a little less scary. All in all it was a good quality food and memorable. Of course we could barely eat three courses and the waiter was worried we didn't like it but I tried to explain, in broken Italian, we had eaten too much. Slow dining takes some getting use too. After a little more strolling we headed back to Venice. We mistakenly took the wrong ferry and spent an additional hour out of our way. I was a little frustrated and ready to call it a night once we arrived 4 stops too far due to over crowding. I think the packed water buses are the only thing I don't care for in Venice but everything else I simply adored and wish we had just one more day there. Our last day in Venezia came too soon. Looking back, I think Venice was one of my favorite places in all of Italy and I wish we would've had more time to explore. Something about that floating city left me wanting more but, alas, we had to say arrivaderci and move on to our next destination, Cinque Terre.